Not many people would associate India with beef. Spirituality yes, perhaps even vegetarianism, but certainly not beef. But then they have probably never been to Kerala, the south Indian state that loves its beef - preferably fried. The Kerala beef fry is the stuff of legend. The best sort, I was told, is served at tiny shops by the roadside, so nondescript that you might miss them completely if not for the aroma wafting out. It is a truly delicious smell with hints of coconut, curry leaves, cinnamon, cloves, coriander powder and roasted chilly. I visited one such shop, called the Paputty hotel. Paputty does not bother with unnecessary items like menus. If you have bothered to come in, it's assumed you want the beef fry. That's the only thing my hosts, Hari Lal and Ranjeet PA, want to eat, but to humour me they order a lavish spread including beef fry, beef curry, beef roast, as well as the quintessential Kerala bread, "Malabar parantha" and thin rice noodles called "idiyappam". "When I put beef fry in my mouth, my tongue tells me I am in real heaven now," Hari tells me. The key to this "heavenly" dish is coconut, a selection of Kerala spices and a lot of patience. To make authentic beef fry or "Thanga Kotthu Irachi", the meat has to be stir fried along with coconut flakes on a slow flame for half a day. "Visitors prefer beef curry, made in a gravy of tomatoes and coconut milk, since that is what they associate with Indian food, but it is the beef fry that is the most popular preparation with locals in Kerala. Full of flavour, it can be had every day or made part of a special Sunday lunch," Kerala chef Nimmy Paul, who organises cooking classes for tourists, tells the BBC. Her recipe for beef fry incorporates a special preparation of ground spices that include coriander powder, chilli, black pepper, cinnamon and cloves. 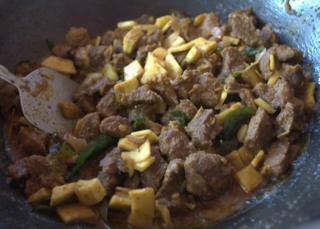 This fragrant mixture is massaged on to small cubes of beef along with an equal portion of coconut chunks. This is then all slow cooked in a pan with a heavy bottom. The more the beef is roasted, the darker the colour and richer the aroma of the dish. "I love that it is so succulent and melts in my mouth, and unlike mutton and chicken, it is light on the stomach", Ranjeet tells me at the hotel. It is also light on the pocket. The entire beef spread at Paputty hotel costs us a mere two pounds ($2.68). This love for beef is, as mentioned before, unusual for Hindu-majority India, where the cow is largely considered sacred. Most parts of northern, central and western India, in fact, have a complete or partial ban on cattle slaughter and beef consumption. However Kerala, despite having a 55% Hindu population is one of the few Indian states with no ban. Executive Chef at Brunton Boatyards, Manoj Nair, explains that beef in fact, is a "secular meat" here. "Beef is very important for Kerala. There can be a Hindu, Muslim and Christian sitting at one table and they'd bond over a plate of beef fry and parantha despite any differences of caste and class," he says. Beef is such an intrinsic part of the Kerala identity in fact, it has even become political. Like a group of youngsters who started a Facebook page by the name "Beef Janata Party", a spoof on the country's ruling Hindu nationalist Bharatiya Janata Party, which has been perceived to be cracking down on the slaughter and consumption of cows. "At no time have beef bans been imposed so forcefully as they are now. With cattle vigilante gangs and mob lynching, this is fascism in its most scary form," a representative from the group told the BBC, requesting anonymity. For the average Kerala citizen, spicy beef and a couple of glasses of the locally brewed coconut toddy are essential fodder for heady political debates. A sentiment expressed passionately by my companion Hari. "If they ever think of banning beef or toddy from Kerala, I will just leave."